One of these fantastic soups is Sopa de Albondigas, which we offer as an appetizer. Sopa de Albondigas translates to meatball soup, which is an accurate description of the soup. The meatball soup originated in the Middle East. The area, now Southwestern Europe, was under Islamic control, and the name “albondigas” has Arabic roots, as “al-bunduq” means “the hazelnut” in Arabic, and appears to denote meatball due to the two’s similar size and shape. 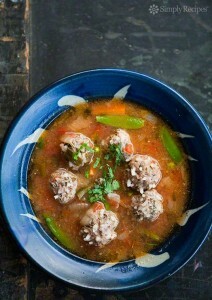 Interested in making your own Sopa de Albondigas? Check out this recipe from Simply Recipes! Heat oil in large heavy-bottomed pot (5-qt) over medium heat. Add onion and cook until tender, about 5 minutes. Add the garlic and cook a minute more. Add broth mixture and tomato sauce. Bring to boil and reduce heat to simmer. Add carrots and string beans. Prepare the meatballs. Mix rice into meat, adding mint leaves and parsley, salt and pepper. Mix in raw egg. Form mixture into 1-inch meatballs. Add the meatballs to the simmering soup, one at a time. Cover and let simmer for 1/2 hour. Add the peas towards the end of the 1/2 hour. Add a few pinches of oregano and sprinkle with salt and pepper, and a dash of cayenne, to taste. Garnish with chopped fresh cilantro. Just follow those five steps and viola: you have a delicious bowl of Sopa de Albondigas! If you want to learn recipes for more Mexican Cuisine, check out our blog. Or, if this seems like too much effort, stop into Acapulcos so we can make Sopa de Albondigas and more for you! We have locations in Massachusetts and Connecticut.